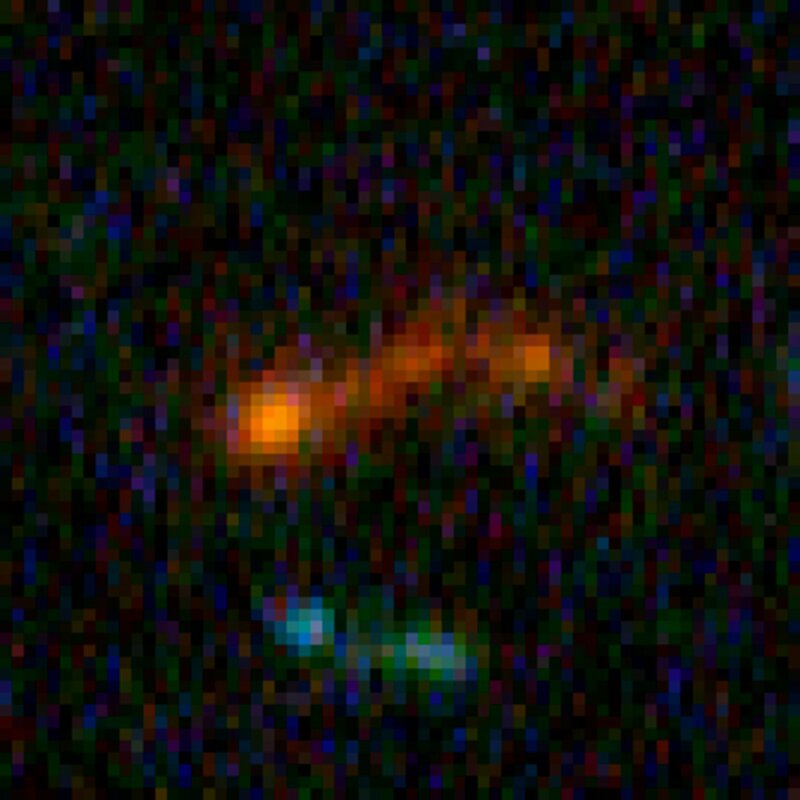 The NASA/ESA Hubble Space Telescope and the NASA Spitzer Space Telescope have joined forces to discover nine of the smallest, faintest, most compact galaxies ever observed in the distant Universe. Blazing with the brilliance of millions of stars, each of the newly discovered galaxies is a hundred to a thousand times smaller than our Milky Way Galaxy. 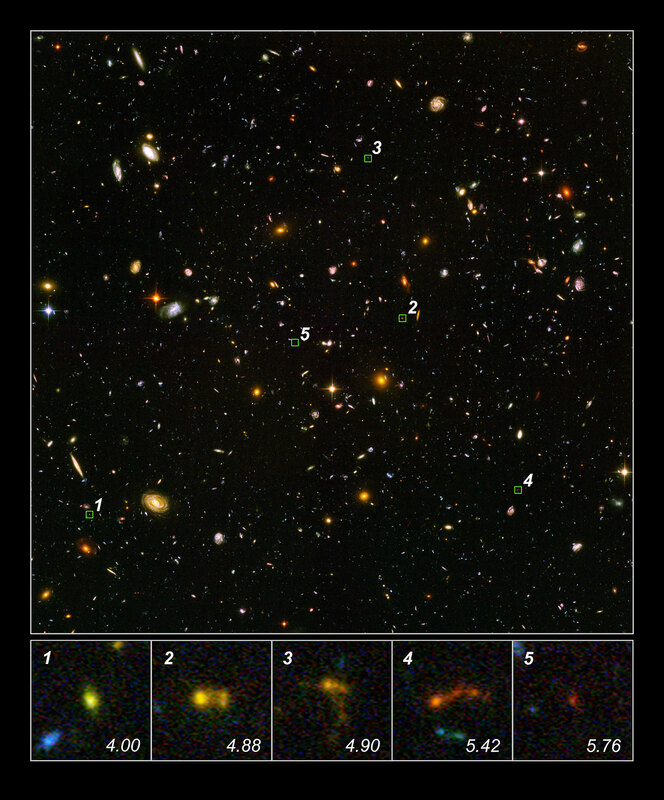 The conventional model for galaxy evolution predicts that small galaxies in the early Universe evolved into the massive galaxies of today by coalescing. Nine Lego-like "building block" galaxies initially detected by Hubble likely contributed to the construction of the Universe as we know it. 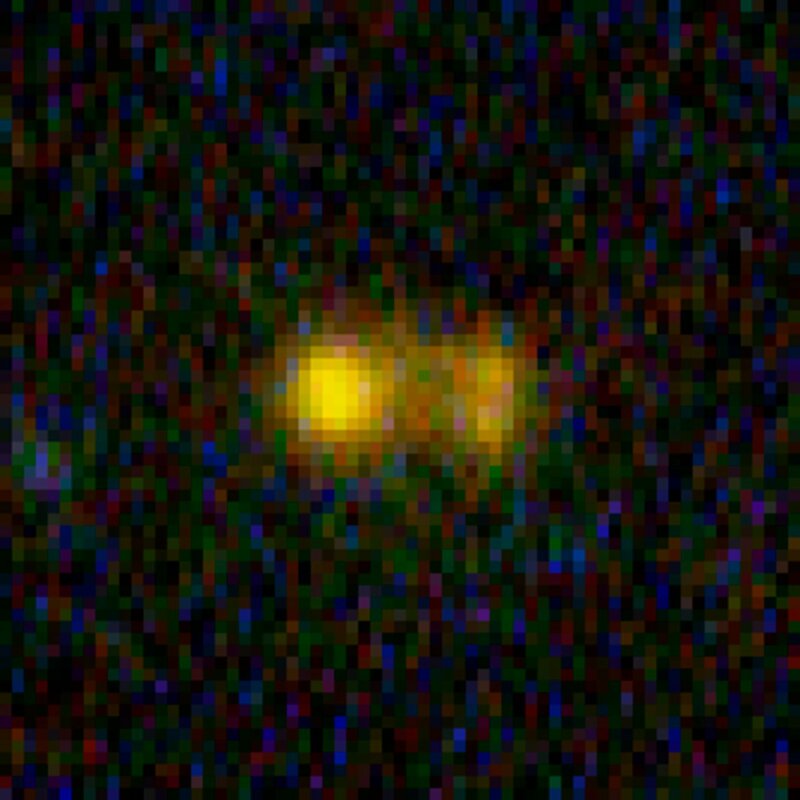 "These are among the lowest mass galaxies ever directly observed in the early Universe" says Nor Pirzkal of the European Space Agency/STScI. These young galaxies offer important new insights into the Universe's formative years, just one billion years after the Big Bang. 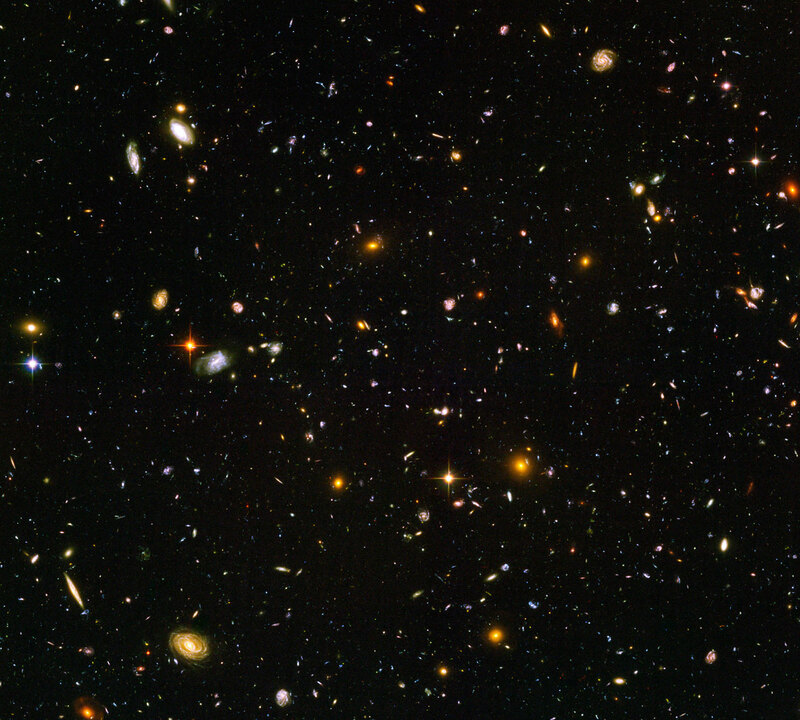 Hubble detected sapphire blue stars residing within the nine pristine galaxies. The youthful stars are just a few million years old and are in the process of turning Big Bang elements (hydrogen and helium) into heavier elements. The stars have probably not yet begun to pollute the surrounding space with elemental products forged within their cores. "While blue light seen by Hubble shows the presence of young stars, it is the absence of infrared light in the sensitive Spitzer images that was conclusive in showing that these are truly young galaxies without an earlier generation of stars," says Sangeeta Malhotra of Arizona State University in Tempe, USA, one of the investigators. 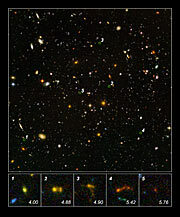 The galaxies were first identified by James Rhoads of Arizona State University, USA, and Chun Xu of the Shanghai Institute of Technical Physics in Shanghai, China. 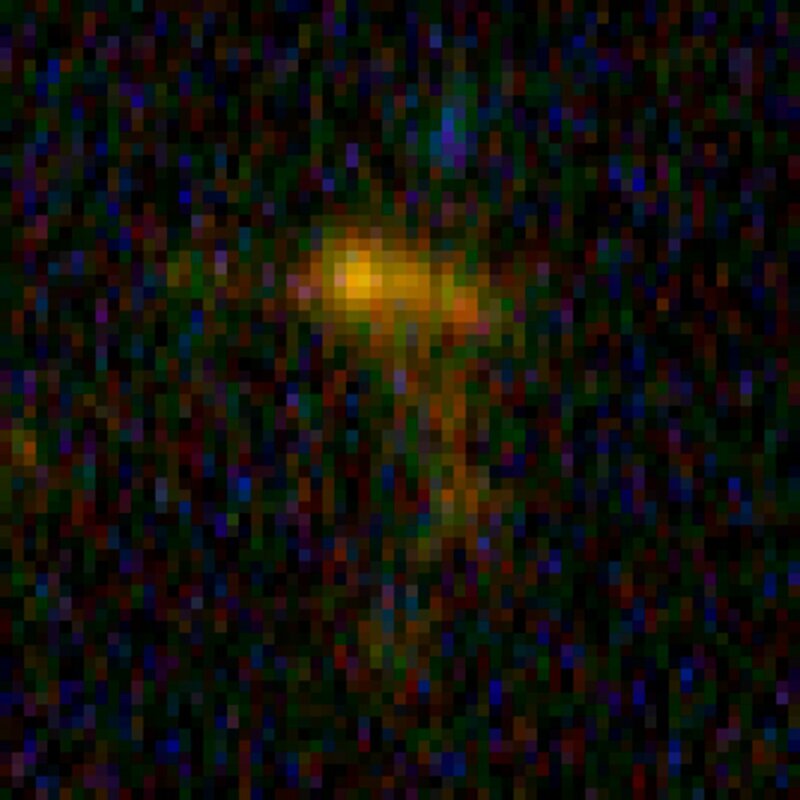 Three of the galaxies appear to be slightly disrupted - rather than being shaped like rounded blobs, they appear stretched into tadpole-like shapes. 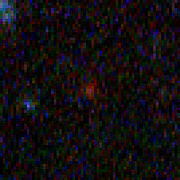 This is a sign that they may be interacting and merging with neighbouring galaxies to form larger, cohesive structures. 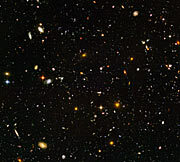 The galaxies were observed in the Hubble Ultra Deep Field (HUDF) with Hubble's Advanced Camera for Surveys and the Near Infrared Camera and Multi-Object Spectrometer as well as Spitzer's Infrared Array Camera and the European Southern Observatory's Infrared Spectrometer and Array Camera. 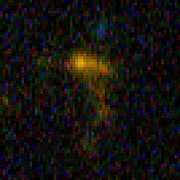 Seeing and analysing such small galaxies at such a great distance is at the very limit of the capabilities of the most powerful telescopes. 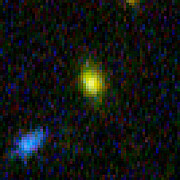 Images taken through different colour filters with the ACS were supplemented with exposures taken through a so-called grism which spreads the different colours emitted by the galaxies into short "trails". 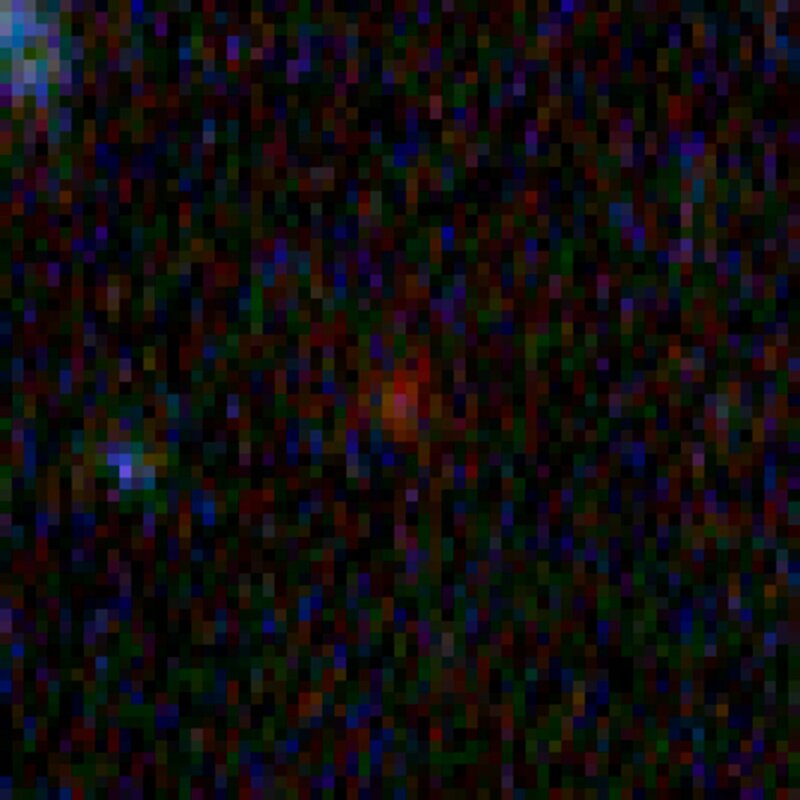 The analysis of these trails allows the detection of emission from glowing hydrogen gas, giving both the distance and an estimate of the rate of star formation. These "grism spectra" - taken with Hubble and analysed with software developed at the Space Telescope-European Coordinating Facility in Munich, Germany - can be obtained for objects that are significantly fainter than can be studied spectroscopically with any other current telescope.